Hankies Include Name or Initials!! ONLY TAKING ORDERS FROM MY ETSY.COM PAGE FOR NOW! each side depending upon lace used. Name or Initials can be monogrammed above design!! Custom handmade by order women's black handkerchief with cross/side flowers embroidery design trimmed with white. Handkerchief is finished with white lace. Custom handmade by order women's wedding something blue handkerchief for the bride include oval framed initial embroidery design, groom & bride first name and wedding date. Custom handmade by order women's red handkerchief with triple hearts embroidery design. Handkerchief is finished with silver/gray lace. Custom handmade by order women's purple handkerchief with triple hearts embroidery design. Handkerchief is finished with white lace. Custom handmade by order wedding something blue handkerchief for the bride. Include phrase For As Long As We Both Shall Live, Groom & Bride First Name and wedding date. Custom handmade by order wedding something blue handkerchief for the bride. Include phrase Celebrating Our Love, Groom & Bride first name and wedding date. Doves and wedding rings. Custom handmade by order women's wedding handkerchief with initial. Something blue for the bride or a gift for someone special. Fabric square is approx 10 1/2 inches on each side. Blue lace is approx 3/4 inches wide. Fabric square is approx 10 1/2 inches on each side. White crocheted lace is approx 3/4 inches wide. Custom handmade by order ladies white handkerchief with cross/side flowers embroidery design trimmed with black. Handkerchief is finished with black lace. Custom handmade by order ladies white handkerchief with cross/side flowers embroidery design. Handkerchief is finished with burgandy lace. Custom handmade by order ladies white handkerchief with cross/side flowers embroidery design. Handkerchief is finished with red lace. Custom handmade by order ladies white handkerchief with cross/side flowers embroidery design. Handkerchief is finished with purple lace. embroidery design with ivory thread. Handkerchief is finished with ivory lace. embroidery design. Handkerchief is finished with ivory lace. Custom handmade by order ladies brown handkerchief with cross/flowers embroidery design. Handkerchief is finished with brown lace w/taupe ribbon trim. handkerchief with cross/flowers embroidery design trimmed w/baby blue thread. Handkerchief is finished with baby blue lace. For the Mother of the Bride. Ivory handkerchief w/Two Doves and Rose w/initials and date embroidered below design. You can use your wedding colors. Men's Black Wedding Handkerchief w/wedding party design. Include first name or initials and bride and groom first name or initials and wedding date. Black handkerchief w/Wedding Party design. Groom's wedding handkerchief has frame w/top hat and bow tie design. Include groom and bride first name or initials and wedding date. Custom handmade by order ladies white handkerchief with an angel embroidery design trimmed with gold thread in top corner. Handkerchief is finished with white and gold lace. Custom handmade by order ladies white handkerchief with a gold cross and praying hands embroidery design with bright yellow gold light background. Handkerchief is finished with white and gold lace. Custom handmade by order ladies black handkerchief with cross/flowers embroidery design trimmed with metallic black/silver thread. Handkerchief is finished with black lace. Custom handmade by order ladies royal blue handkerchief with cross/flowers embroidery design trimmed w/vari-blue thread. Handkerchief is finished with royal blue lace. Custom handmade by order ladies blue handkerchief with cross/side flowers embroidery design. Handkerchief is finished with white lace. Custom handmade by order ladies purple handkerchief with cross/side flowers embroidery design. Handkerchief is finished with black lace. Custom handmade by order ladies white handkerchief with angel embroidery design bottom corner and phrase of your choice. Handkerchief is finished with gold/white lace. Custom handmade by order ladies white handkerchief with angel embroidery design bottom corner. Handkerchief is finished with gold/white lace. For the Bride or Bridesmaid. White handkerchief w/Two Become One embroidered inside a frame w/initials and date embroidered below frame design. This hanky is trimmed w/turquoise lace but you can use your wedding colors. All white handkerchief w/cross & side flowers design. Mens white handkerchief w/bible design and initials or scripture monogram. Men's white handkerchief with gold cross, purple cloth drape and gold writing. Men's White Handkerchief w/gold cross, purple cloth drape and purple writing. Men's white handkerchief w/cross, bible and fish. Men's white handkerchief w/bible and cross. Custom handmade by order ladies white handkerchief with a bible embroidery design trimmed with black. Handkerchief is finished with black lace. Custom handmade by order ladies white handkerchief with a vari-taupe cross/side flowers embroidery design. Handkerchief is finished with beige lace. Custom handmade by order ladies white handkerchief with cross/flowers embroidery design trimmed with red. Handkerchief is finished with red lace. Custom handmade by order ladies white handkerchief with cross/flowers embroidery design trimmed w/pink. Handkerchief is finished with pink lace. 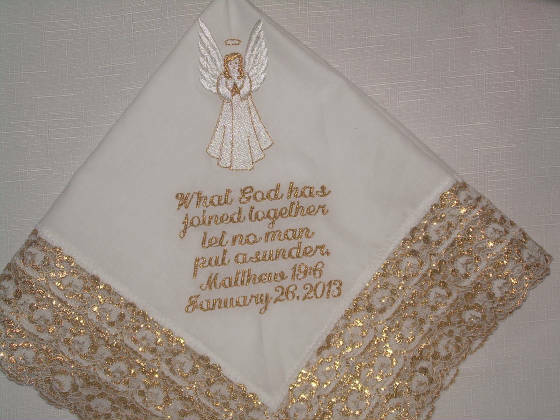 Custom handmade by order ladies white handkerchief with a bible embroidery design trimmed with gold. Handkerchief is finished with white and gold lace. Custom handmade by order ladies white handkerchief with a gold cross and praying hands embroidery design with soft yellow light background. Handkerchief is finished with white and gold lace. Custom handmade by order ladies white handkerchief with cross/flowers embroidery design trimmed with black thread. Handkerchief is finished with black lace. 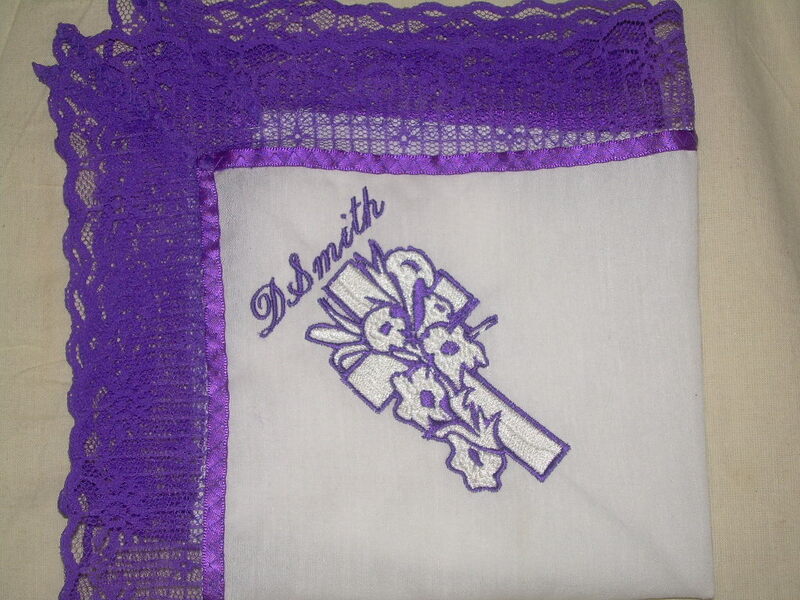 Custom handmade by order ladies white handkerchief with cross/flowers embroidery design purple thread. Handkerchief is finished with purple lace. Custom handmade by order ladies white handkerchief with a cross/flowers embroidery design trimmed with gold. Handkerchief is finished with white and gold lace. Custom handmade by order ladies white handkerchief with a gold cross and praying hands embroidery design with gold light background. Handkerchief is finished with white and gold lace. Custom handmade by order ladies red handkerchief with vari-red cross/w side flowers embroidery design. Handkerchief is finished with red lace. Custom handmade by order ladies red handkerchief with cross/flowers embroidery design. Handkerchief is finished with red lace. Custom handmade by order ladies white handkerchief with gold cross/w side flowers embroidery design. Handkerchief is finished with white and gold lace. Custom handmade by order ladies white handkerchief with cross/flowers embroidery design with silver trim. Handkerchief is finished with silver and white lace. Custom handmade by order ladies white handkerchief with a silver cross/w side flowers embroidery design. Handkerchief is finished with white and silver lace. Custom handmade by order ladies white handkerchief with a bible w/silver trim embroidery design. Handkerchief is finished with white and silver lace. Custom handmade by order ladies black handkerchief with a bible embroidery design trimmed with black/silver thread. Handkerchief is finished with black lace. Custom handmade by order ladies black handkerchief with a cross w/side flowers embroidery design. Handkerchief is finished with black lace. Custom handmade by order ladies white handkerchief with an angel embroidery design trimmed with silver. Handkerchief is finished with white and silver lace. Custom handmade by order ladies white handkerchief with a silver cross and praying hands embroidery design with bright yellow gold light background. Handkerchief is finished with white and silver lace. Custom handmade by order ladies royal blue handkerchief with shades of blue cross/w side flowers embroidery design. Handkerchief is finished with royal blue lace. Custom handmade by order ladies ivory handkerchief with cross/flowers embroidery design w/vari-taupe trim. Handkerchief is finished with ivory lace. handkerchief w/butterfly embroidered in corner. Hanky is trimmed w/white lace. Custom handmade by order ladies purple handkerchief with triple hearts embroidery design. Handkerchief is finished with purple lace. Custom handmade by order pink handkercief with butterfly embroidery design. Handkerchief is trimmed w/green lace. twist embroidery thread and trimmed w/navy blue lace. Navy Blue handkerchief w/shades of blue triple hearts embroidered in corner. Hanky is trimmed w/white lace. White wedding handkerchief Hanky w/blue monogram is trimmed w/white lace. Brides something blue wedding handerchief w/Two Become One monogrammed in center of olive leaves. Wedding date monogrammed below design. Hanky is whte trimmed w/blue lace w/blue embroidery. Brides something blue wedding handerchief w/Two Become One monogrammed in center of olive leaves. Hanky is creme trimmed w/creme lace. Bridemaides wedding handerchief w/name or initials in center of olive leaves and wedding date under. Black w/lavender lace handkerchief w/butterfly embroidered, trimmed w/lavender lace. Royal blue handkerchief w/butterfly embroidered in corner trimmed w/matching lace.. Lavender handkerchief embroidered w/orchid & lavender twist embroidering thread and trimmed w/lavender lace. In Memory of a Loved One. Included is name, birthdate, going home date. Silver monogramming on a white hanky trimmed w/white and silver lace. A Great Keepsake for Your Loved One. In Memory of a Loved One. Included is name, birthdate, going home date. Gold monogramming on a white hanky trimmed w/white and gold lace. A Great Keepsake for Your Loved One. White handkerchief w/gold triple hearts embroidered in corner. 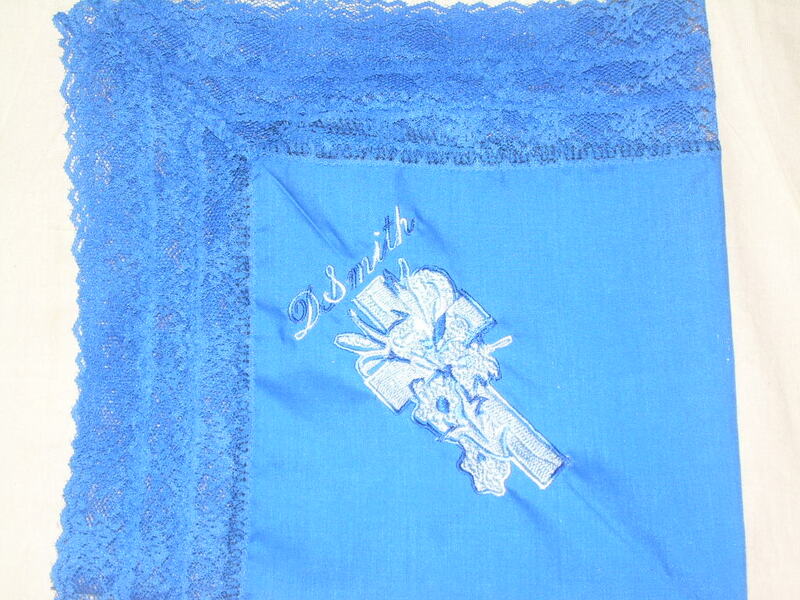 Hanky is trimmed w/gold and white lace. Brides something blue wedding handerchief w/Two Become One monogrammed in center of olive leaves. Hanky is trimmed w/blue lace. Custom handmade by order brown ladies church handkerchief. Butterfly design w/ivory/creme lace. Name or initals available. Triple hearts design w/matching lace. Custom handmade by order ivory/creme ladies church handkerchief. Butterfly design w/matching lace. Name or initals available. Red handkerchief embroidered w/red varigated embroidery thread, and trimmed w/red lace. Black hanky w/triple hearts embroidered in corner of design. Hanky is trimmed w/black lace. Royal blue & white butterfly on white handkerchief, trimmed w/royal blue lace. Red & white butterfly on white handkerchief, trimmed w/red lace. All white handkerchiefs. White flowers on white handkerchief trimmed w/white lace. Pink handkerchief w/triple pink hearts trimmed w/matching lace. Turquoise & white butterfly on white handkerchief, trimmed w/turquoise lace. Teal & white butterfly on white handkerchief, trimmed w/teal lace. White handkerchief w/ green stems and purple flowers embroidered in corner w/name or initials embroidered in center of design. Hanky is trimmed w/white lace. Ice Blue & white butterfly on white handkerchief, trimmed w/white lace. Yellow & white butterfly on white handkerchief, trimmed w/yellow lace. Purple & white butterfly on white handkerchief, trimmed w/purple lace. Black & white butterfly on white handkerchief, trimmed w/black lace. White hanky w/gold and white butterfly embroidered in corner. Hanky is trimmed w/gold and white lace. White handkerchief w/silver and white butterfly embroidered in corner. Hanky is trimmed w/silver and white lace. White handkerchief w/a white heart shaped design embroidered in corner w/Jesus embroidered in center of design. Hanky is trimmed w/white lace. Yellow embroidered w/3 color yellow embroidering thread, and trimmed w/yellow lace. Peach with a darker peach embroidery thread, and trimmed w/peach lace. White embroidered w/silver metallic embroidering thread and trimmed w/white & silver lace.